In the amphitheatre of the Military Medical Academy diplomas were awarded to the first class of cadets that had graduated from MMA Faculty of Medicine of the University of Defence. On that occasion, they were promoted to physicians, and they will receive their first officer rank – medical service corps lieutenant. The ceremonial meeting was attended by the Rector of the University of Defence Major General Prof. Dr. Mladen Vuruna, Acting Head of MMA Colonel Prof. Zoran Segrt, Dean of the MMA Faculty of Medicine, Colonel Prof. Nebojsa Jovic, teachers of the higher education institution, parents of the young doctors and their fellow cadets and numerous guests. General Vuruna stressed that this day would go down in history of military medicine and military education of the Republic of Serbia. He recalled that six years ago, determined people with a clear idea and vision had established the MMA Faculty of Medicine, and the latter leadership had given the development incentive, so that today the result is evident - 18 young military doctors. Acting Head of MMA Zoran Segrt said he was honoured to be in the position to congratulate the first generation of military doctors from that faculty on the successful completion of studies at the Faculty of Medicine of the Military Medical Academy. - You have worked very hard. You have acquired new knowledge with your education and achieved very good success. Each year was with an average of more than 9. Total average of the first generation was excellent - 9.48 - Prof. Dr. Segrt said. Dean of the MMA Faculty of Medicine, Colonel Prof. Nebojsa Jovic said that a long way had been crossed from what had been just an idea on how to ensure a quality future for military healthcare to this day, in which we celebrate mutual success. 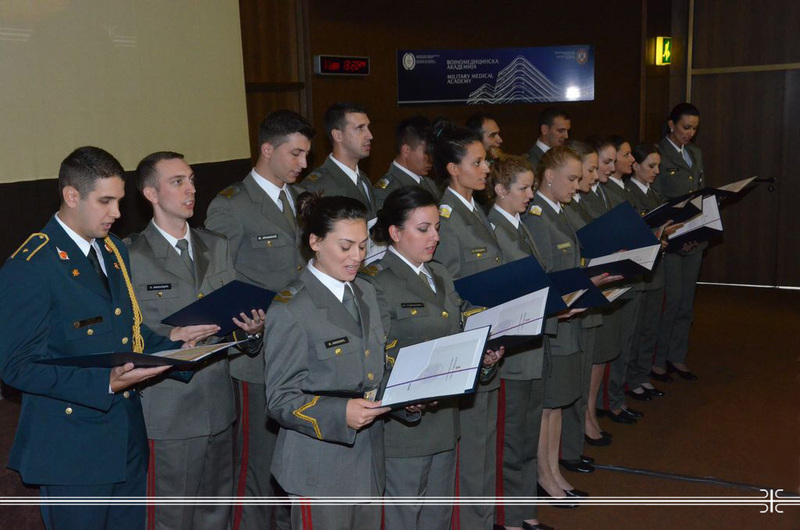 Colonel Jovic presented the diplomas to the first class of cadets, including the first three in the ranking - Goran Savic, Natasa Petkovic and Ahmet Hadziahmetagic, who will also receive their deserved rewards at the ceremony in front of the National Assembly.